If you want to see your abs, you're going to have to lose A LOT of body fat. Everyone is a bit different, but typically you can see all of your abs when you are between 7-12% body fat. This varies from person to person based upon fat distribution patterns, body shape/type, hormonal fluctuations, fluid retention, and amount of muscle. Personally, I don't see my abs until I'm about 7.5%-8% body fat; the trouble is anything under 10% for a man -- or 12% for a woman -- increases risk of injury. So, if I really want to have a six pack, I have to risk injury to my muscles and joints. In other words, my body is designed to be lean, strong, and capable; but, a six pack is not natural. Of course, I've tempted fait in the past to see if I could get six pack abs. As it turns out, I have an 8-pack, which was pretty cool to find out! Anatomically speaking, my "six pack muscle" (rectus abdominus) is divided into 8 sections, rather than six. This is just the way I was born. 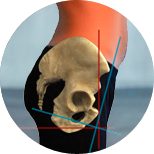 Your pelvis is out of position. Inflammation means your body is attempting to heal. Generally speaking, swelling related to exercise will last up to 48-72 hours, and that's perfectly normal. However, when swelling lasts longer -- or begins to stiffen (i.e. pitting edema, which has a boggy, more solid feel to it) -- you might want to see a Physical Therapist or Massage Therapist for some help bringing it back down. During a period your body is inflamed from exercise, it's a good idea to rest at least that 'type' of exercise. This means heavy weight training can be alternated by days of outdoor activity, cardio, muscle balancing, or bodyweight training. However, we wouldn't want to do another heavy workout until all inflammation has calmed down. 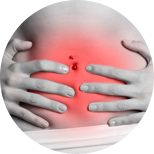 experience inflammation that are not related to exercise. Poor venous return -- aging, pregnancy, and vascular disease all contribute to loss of venous return. If you notice repeated swelling in your feet and ankles, or hands and fingers, you might want to get checked out by a vascular surgeon to be sure you're not at risk for something more serious. Most of the time, it's nothing, and can be handled by water-walking, stair-stepping, and soft tissue mobilization/massage. Bursitis, Tendonitis, or any other chronic injury -- if you're an athlete, you used to be, or you exercise a lot, you are at risk for these types of injuries; that's the downside of being so active. But, as a professional football player knows the risk of playing football, we must know the risk of exercising and living healthy: we can get hurt, if we're not careful to stay balanced. No matter the cause of inflammation, we're going to need to work on balancing muscles, stabilizing joints for increased strength and stability, and healing any past injuries, trauma, or strain on another bodily system. Remember, we need to take care of your body's highest priority first, in order for it to lose body fat or add definition. First, let's start with bodily systems. When you go to an emergency room, they evaluate you from the most critical organs (i.e. your heart, brain and spinal cord) outward. This is to protect your life, but the same philosophy can be applied to getting a flat stomach: start with the most critical issue first and optimize your health, from highest priority to lowest. For example, high cholesterol and triglycerides may be placing too much strain on your heart, so it will be difficult to lose that last bit of fat. Or you might have trouble digesting meals, so your body holds onto an extra bit of fat and ends up swollen. Another common issue is spinal position -- since so many people spend years of their lives sitting -- which affects the length and position of muscles all over the body and your ability to communicate with them. Most people who exercise tend to overtrain the side of the body they can see in the mirror. We usually over-train our pecs, over-lengthen our lats, and round our shoulders while tipping our chins up. It's a natural tendency, as it's normal to want to look great head-on. However, it's a failed strategy for training, since our bodies actually look -- and function -- much better when symmetrical. Neck flexors are often weak in the clients and patients we see, having been over-stretched. Neck extensors also tend to be weak, as they've been over-shortened with the 'chin-up' position (that makes us look like we don't have a double chin in the mirror). In order to correct this muscle imbalance, it's important to train your 'axial extensors,' or the muscles that help you push the back of your head into a pillow with a neutral spine position. Aligning your neck means you are strengthening the electrical signal to every muscle in your body, including your abs. Upper traps tend to dominate. If you feel the 'good hurt' when someone massages your traps, it's a good bet you're over-active in your upper traps and could use some more strength and endurance in your middle and lower traps. Rotator cuff imbalances take place when the neck is out of position, traps are imbalanced, pecs are too strong for lats, or from repetitive use and poor positioning. Over time, external rotators get very tight, and it becomes difficult to get your hands behind your back in the 'unhook a bra strap' position. If this sounds like you, you'll want to be sure to balance out your rotator cuff, as the strength of the nerve signal to your pecs and lats is being reduced to protect you from injury. Your low back balances the strain from your abs and vice versa. This means if you develop strong abs, you'll want to be sure to balance out with bridges, deadlifts, multifidus twists, and other lower and mid-back exercises. Please don't forget to develop low back strength and endurance or it will inevitably lead to low back pain. Balancing abs and low back strength isn't only important for reasons of definition, but also for pelvic alignment and spinal stability. When your pelvis and spine are properly aligned, nerve signals more easily reach the muscles in your lower body, allowing you stronger muscle contractions with every exercise. Since so much muscle is housed in your lower body, you can imagine the effect on your metabolism when you recruit more muscle with every rep of every exercise you do. Hip rotators are designed to disburse force as you pound your heels into the ground with every step. That stress typically goes up your shin bone, then your upper leg bone, and finally it reaches your low back. If you naturally toe in or out when you walk, more pressure will be placed into your low back with every step. Plus, every time you go beyond your hip range of motion when turning or taking a diagonal step, it's your low back that will take the strain. It's a good idea to practice doing Z-sits and rotational/pivot squats and lunges until your hip rotators are both symmetrical and able to move throughout the full range of motion. Your abs -- and low back -- will thank you. It used to be thought that quads could be twice the strength of hamstrings; now, it's widely accepted that hamstrings and quads need to be equal strength to prevent knee injury and improve athletic performance. When you strengthen your hamstrings -- especially up by your glutes -- you'll see your abs and core strength progress, as well. The easiest way to explain this is that you're creating a diagonal pull on your pelvis from your abs, hip flexors and quads in the front and you're doing the opposite from your low back, glutes, and hamstrings in the back. When you pull from both sides equally, everything aligns, moves well, and looks great. Your quads are also balanced by your calves while walking and running. Basically, your calves anchor your knee joint from the back side when your quads pull your lower leg bone forward with every forceful contraction. This is why it's so important to add a heel raise to exercises like step ups, squats, and lunges from time to time. These tiny little muscles are in the bottom of your feet and work together with ligaments and fascia to form your arches. These "foot intrinsic muscles" are excellent shock absorbers with every step when properly trained. They can take a lot of pressure off your ankles, knees, hip rotators, and low back; similarly, if forgotten, extra pressure translates all the way up the chain and can cause early fatigue and injury. It seems silly to train the bottoms of your feet for abs, but let's face it: seeing your abs means you're dialing everything in and optimizing your body; that's how to get under 10-12% body fat without injury. "Now, when it comes to balancing movement, let's consider 'how' we move, 'how fast' we move, and the quality of the movement." Isotonics -- which involve moving while contracting muscles -- are important for training all muscles in the body, independent of which muscle type it is. Even tonic muscles, like your core, need to be trained isotonically, or with movement. Examples of great isotonic exercises include: squats, deadlifts, lunges, pull ups, push ups, presses, bridges, moving plank variations, turkish get ups, cleans, presses, jerks, jumping jacks, and split jacks. Depending on the exercise, you might be doing an isotonic exercise for your biceps and lats, but an isometric for your core (pull up). In another example, like a squat with rotational press, you will be using your core muscles to move, while also using other muscles to move. So, a squat with rotational press would be considered an isotonic exercise all around. I feel it's impossible to over-emphasize that quality of movement comes first. You see, there's something called muscle timing, which is how we determine if a muscle fires at the appropriate time during an exercise. 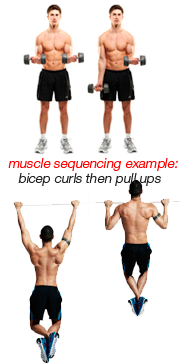 For example, a lot of people struggle with pull ups, and this is often because they are trying to do the exercise with their biceps and forearms, rather than their lats. When you learn to recruit your muscles from your spine outward -- and feel your entire muscle contract -- you are ready to progress speed. Certain muscles naturally have more Type IIa and IIb muscle fibers, because they are meant for sprinting. Other muscles, like your lats, have more Type I muscle fibers because they are meant for posture and strength throughout your day. However, the most important take-home lesson is to train at all speeds, with all muscles. This means superslow (10 seconds concentric/eccentric), normal (2 seconds concentric, 1 second isometric hold, 4 seconds eccentric), and sprint (as fast as you can go without breaking form). Sometimes, you'll want to train your bigger muscles first, and other times, you'll want to tire your little muscles at the beginning of your workout. This is called muscle sequencing. Fatiguing smaller muscles first -- like doing multiple sets of biceps curls before doing pull ups -- forces you to recruit larger muscles to do the exercise. Also, it gives you an opportunity to emphasize strength sets on your biceps, before they become tired from doing pull ups. The main disadvantage is that your biceps are supposed to help during a pull up, and now they are basically useless; so, you're unlikely to make a whole lot of progress on pull ups this way. There are a variety of ways to sequence your exercises, and a purpose for each. 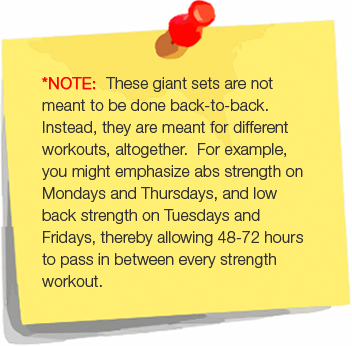 As another example, you might choose opposite muscles, back to back, to create supersets or giant sets. The advantage of choosing opposite muscle groups like your biceps and triceps -- or abs and back -- is that you will turn off the signal to your biceps when you turn on your triceps, and vice versa with non-weight bearing exercises. This is called reciprocal inhibition. In the biceps/triceps example, let's assume you want to build strength in your biceps. Choose lower reps (strength) for your biceps, then higher reps (endurance) for triceps. The goal is to turn 'off' the signal to the muscle you are targeting for strength and provide it with immediate rest, or as close to as possible. 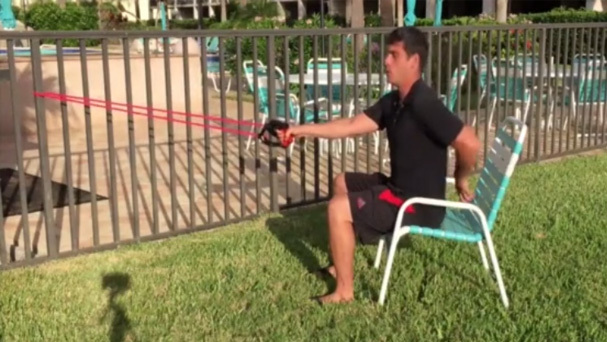 Be sure to hit complete Momentary Muscular Failure (MMF) on each and every exercise. Your goal should be to hit fatigue within 4-6 reps on strength exercises and 12-15 reps on endurance exercises. In order to increase intensity and hit fatigue sooner, you may want to increase weight/resistance, speed, or level of difficulty by adding an unstable surface. Not a member yet? Activate your 30 day FREE trial here. Rest 2-3 minutes and repeat 2-5x. Getting a flat stomach means building abs and back 'strength', but it also means building abs and back 'length'. You see, strength is only 50% of the puzzle. When your muscles can fully contract and stretch, they are more powerful and won't get tired as quickly. If you've been stuck at about the same body fat percentage or physique for awhile now, you may strongly want to consider alternating flexibility workouts with your current routine. This brings up the topic of mixed intensity, which is smart from one day to the next, but also within a given workout. By mixing up your intensity, from a full intensity, explosive first rep of every set, to a sprint-based pace for the next minute or so, and then slow and steady until the end, you will be training all 3 energy systems in your body. This maximizes the metabolic effect of every set you do, which has a compounding effect on each workout, periodization phase, etc. When you see results accelerate over time, it's exciting. And being excited is going to keep you motivated. If you're not seeing some sort of result every 2 weeks, it's time to change something up. Do not underestimate the importance of your state of mind. By far, the most important thing I can say when it comes to exercise and getting a flat stomach is to stick with it, and that'll only happen if you're enjoying yourself along the way. 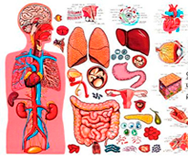 If your organs are healthy, your digestive health is awesome, your muscles are balanced, and your energy level and focus are unstoppable, you're doing great. The final steps involve learning more about your body and how you can influence the way it feels throughout the day. One great example is the ideal timing for sleep each night. It might turn out you are someone who functions best on 7 or 9 hours of sleep, rather than 8. You might be getting to bed late and waking up late, but you may find out you get better sleep during the darkest hours of the night. Or you might be over-sleeping by 15-30 minutes, because you have sleep cycles that last 2 hours and you wake up 8 hours and 15 minutes into your sleep. This means you'll wake up foggy, start slowly, and end up getting less from your day. Also, certain foods will make you feel 110% (your "superfoods") vs others which will make you feel about the same --or worse than -- before you ate them. You may want to consider starting each day with your own superfoods, which will set the tone for how you eat -- and feel -- for the rest of the day. And, as much as possible, eliminate any foods that lower your energy level. Think about it this way -- if you have a flat stomach, less than 10% body fat, and you're eating food for energy, it's a good bet you're fully optimized. This is the spitting-image of health, but always needs to be compared to what's going on inside your body, how you feel, both physically and emotionally, and any other known health variables. Remember, health isn't about comparing you to someone else; instead, it's about comparing your current health to the best it could be, given the circumstances. Extreme dieting and spending hours in the gym works... for awhile. But, then you get hurt, a bit older, and a lot of tendonitis and joint pain. Balance your body, design your exercise program the right way, or let us do it for you. This is your body -- and health -- we are talking about. If you'd like us to take away the guess work, we'll be happy to. Simply click below to activate your membership and begin a 30 day free trial.